Although acupuncture is one of our most popular treatments, many people are unsure, anxious and even sceptical about receiving it. So we’ve answered 5 common questions below. QUESTION 1. Is acupuncture painful? ANSWER: It shouldn’t be! Sometimes there’s a slight ‘scratch’ as the needle passes through the skin. More often people experience some sensations of pressure, warmth or very mild discomfort. QUESTION 2. What are the needles like? ANSWER: Acupuncture needles are very different to the needles used in medical syringes. Acupuncture needles are very fine and have a much smaller diameter with no hollow barrel; meaning they produce very little trauma or pain. QUESTION 3. 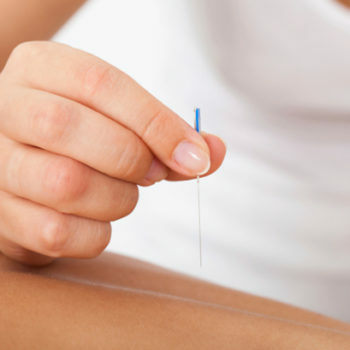 What’s the difference between ‘acupuncture’ and ‘dry needling’? ANSWER: The short answer is- very little! Both approaches insert needles into the body for therapeutic purposes. Traditional eastern acupuncture follows a particular philosophy or ‘way of looking’ at health, illness and the body. Needles may be inserted according to these ancient principles, and therapists often treat a range of different symptoms from nausea to pregnancy and fertility problems. On the other hand, dry needling is often used as an adjunct treatment by our osteopaths and chiropractors, and tends to focus on musculoskeletal problems (e.g. back or shoulder pain). This approach follows contemporary views of health and disease- meaning needles are usually placed according to anatomical and neurological principles. We offer both types of acupuncture at the clinic. QUESTION 4. Does acupuncture work? ANSWER: Yes. Research show that acupuncture can be effective for a variety of problems from anxiety to back pain. However, no treatment works 100% of the time for everyone, and people respond differently. Incorporating a combination of different treatments and lifestyle changes means you’re likely to experience maximum benefit.. QUESTION 5. How does acupuncture work? ANSWER: It’s not fully understood, and it depends on who you ask! Traditional eastern acupuncturists will explain the therapeutic effects through the changing flow of energy (known as ‘qi’). Whereas, modern explanations point to local effects in the muscle (eg increased blood flow) and also changes to the brain via neurological and hormonal effects. Both approaches can be effective for different conditions. Read more about acupuncture at BodyMatters Clinic here.